Through tight woods and over Lambs Creek, with rolling elevation along the basin. "Where the beer is cold and the music hot...Western Wisconsin's Largest Outdoor Patio and Beer Garden!" I-94; exit 41 north past Walmart 5 miles to a right on Cty Rd D. Follow to Lake Tainter. Bar is on the left. Park in gravel parking lot. Scorecard/Maps in the Bar. great facility offering everything from good food and live music to volley ball and disc golf. 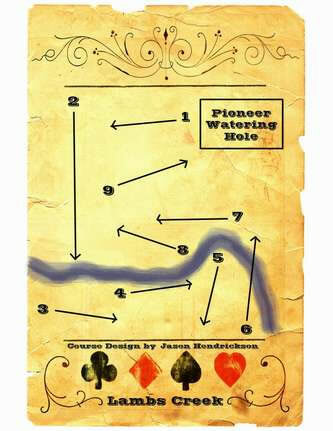 the course demands accuracy and has some very creative holes. definately worth the visit.